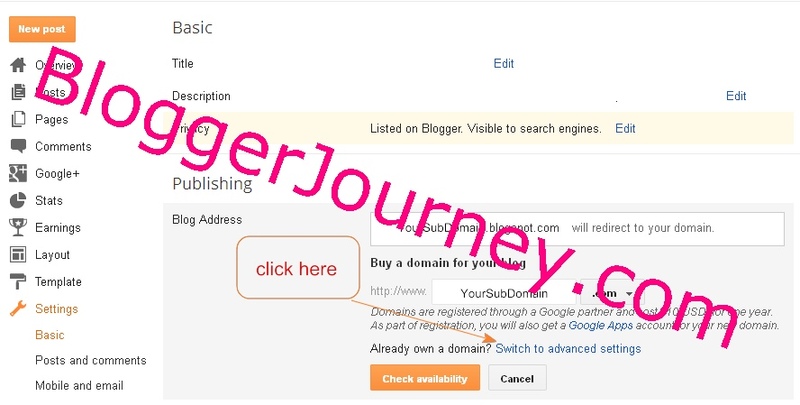 This is a latest step by step guide for setting up the custom domain for Blogger.com (Blogspot) by using the domain name registered at Namecheap. It aims to work with Google's new requirement of 2 CNAME records to be added in your Domain Registrar (Namecheap.com)'s DNS setting. Many online guides have expired after Google's process updated in late September. Here I'd like to share that I did, which works well and has been running successfully with no issue. The following tutorial has been uploaded to Youtube as well, I embed it below for your reference. 2st Step, login to the control panel at Namecheap, add the 2 CNAME records we just got, as well as other 4 A-records. 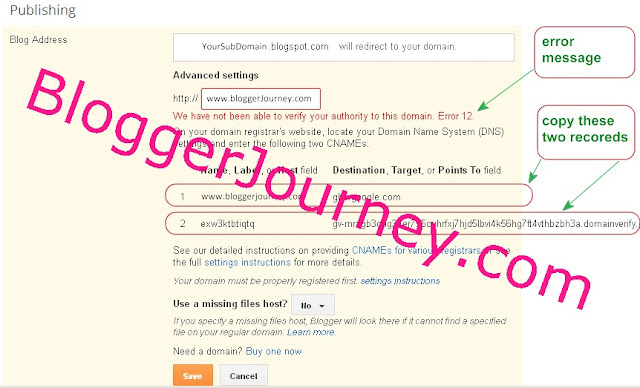 Go to your Blogger dashboard, click on Settings->basic, look at the Publishing section in the main content page, under your Blog Address, click on "Add a custom domian"
3. Now type in your full domain address (starts with WWW.) , and then click on Save. Note: make sure your domain address starts with WWW ! In my case, I typed in www.bloggerjourney.com, and click on 'save' . 4. 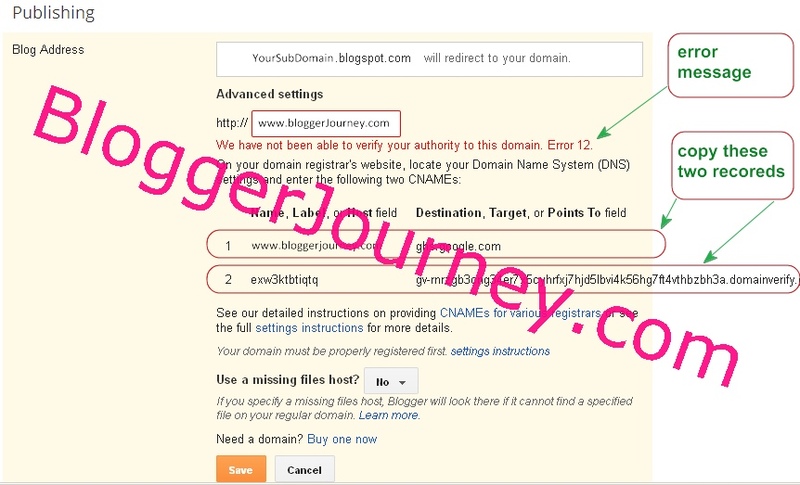 You will see an error message under your domain name "We have not been able to verify your authority to this domain. Error 12." It's normal. You will see 2 line of records showing under the error, that's the two CNAME records we need later. - The 2nd line is different for every one, copy the whole line. the long string "gv-ftqlj5qbkz2ajngptbfi32x6i2dlyisvexjg4a2l2jxliktisx5q.domainverify.googlehosted.com." is the url . Notice the dot '.' at the end of the line ? Copy it do not miss! Make sure to copy both of Host Name and long url, paste into your notepad or word document for later using. 5. Now go to Namecheap.com, login to your account. look at left side under "Account Information" section, at the first line, click on 'View"
6. On the main content page, look at the Domain Name section. If you purchased several domain names from Namecheap, your will see all of their names here. Click on the domain name you'd like to set up for your Blogger. In my case I click on BloggerJourney.com. 8. Now at the main content page, let's add all 4 A-records and 2 CNAME records. 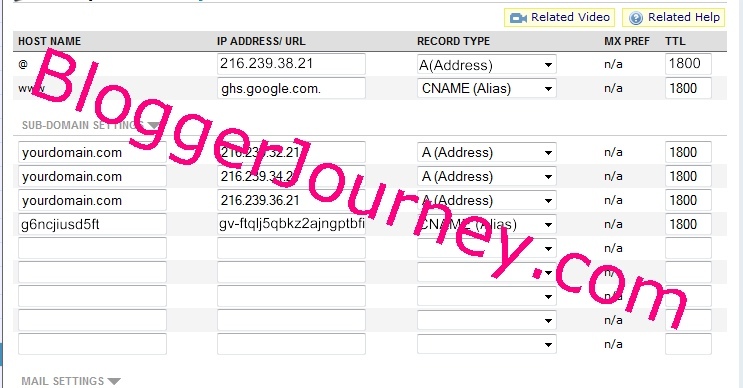 And, two CNAME records that we got at step 4 need to be added as well. For 'Sub-Domain Setting' you type in your domain name. In my case it's BloggerJourney.com . Once you fill up all above 6 lines, you are good to save it. We have finished the settings at Namecheap.com. Almost done. And open a new browser window, at the top address bar type in your Domain name starts with WWW, such as WWW.MyDomianName.Com and let it go. What do you see? If you get a 404 error with a big Google logo on it, your Namecheap records have been set up properly and you can go to next step now ! If you do not see the 404 error with a big Google logo, please wait, refresh the page after a few minutes. Namecheap service is pretty fast, wait for a few minutes should be good enough. Let's go to next step. You are good to go to next step if you see above error with Google logo ! 12. Go back to you Blogger account dashboard, re-do step 1, 2 and 3 again. This time, at step 3, after you click on 'Save' you should not see any error at all. Then, the screen will go back to publishing section again, you will see the Blog Address now is your Namecheap domain name, not the free Blogspot subdomain any more. 13. Click on 'Edit' (behind your new domain name). 14. Under your new domain name, put a check mark infront of the option "Redirect YourDomainName.com to WWW.YourDomainName.Com", and then click on "Save"
Open your browser, first try to open your website using the new domain name starts with WWW, like www.yourdomainname.com. You should be able to see your blog coming out instantly. - My experience was, it took effect also instantly. I was able to access my web page by using the new domain name in only a few minutes after the settings updated. Then, open your site by using your naked domain name without WWW in front, like yourdomainname.com. - Probably you see an error page. No worries, it may take several hours for the naked name to be populated. So, you can check back again later after several hours. 16. Congratulations ! You Done. 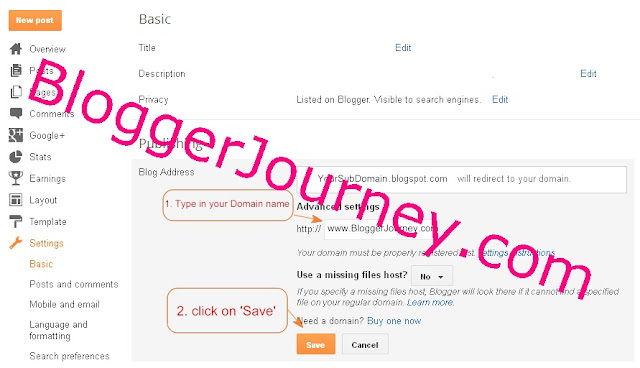 Till now, we have successfully set up the Namecheap domain name on Blogger (blogspot)! Namecheap is one of the best domain name registrar on the market, currently its service is rated 4.6 out of 5 on Google Checkout. Namecheap's domain price is cheap ($10.69 per year) but not the cheapest ($7.99.com Domain with Free InstantPage Website Builder from GoDaddy.com! ), while if you consider to get Domain Name together with Domain Privacy, then Namecheap is the most cheapest- it provides free Domain Privacy (calls it WhoIsGuard service) for the first year, and $1.99 afterwards. Compare with other companies' above $10 charge for the domain privacy, it's a big save. Register domain name at Namecheap is simple and easy, and it's service is reliable, the speed is amazing fast - it almost instantly took effect after I point my domain to the hosting company ! That's why I like Namecheap and highly recommend it if you are considering to get a new domain. I tried this about six hours ago but was missing the 4 IP addresses, as they weren't included in the instructions I got. Followed your instructions and my blogger site redirected to my NameCheap site in, oh, about 45 seconds. It's glad to hear. Thank you Rachel for the feedback ! Thanks a lot man I used this guide too. Thanks . I have successfully activated it to custom domain name. What about the sitemap.xml , will it configure automatic ? i cannot find /sitemap.xml for ping to search engine.